SPECS uses synthetic methods to study and synthesize the neuronal, psychological and behavioural principles underlying perception, emotion, and cognition. SPECS is also very much involved in the development of scientific co-operation in the field of Biomimetics and Neurotechnology, as well as in Educational and Outreach activities. Classical conditioning, operant conditioning and learning models based on the Distributed Adaptive Control framework, which has become a standard in the field of artificial intelligence and behavior-based robotics (McFarland and Bosser, 1993; Hendriks-Jansen, 1996; Arkin, 1998; Pfeifer and Scheier, 1999; Clancey 1996; Cordeschi, 2002). The HLB is primarily involved in the development, implementation, and analysis of machine-brain-machine interfaces. The HLB was involved in the ReNaChip FP7 project, whose overarching goal is to build s neuroprosthetic neuromorphic chip recovering a learning function lost in the aged cerebellum. By using advanced digital humanities technologies, and making it accessible online, we can conserve, develop and preserve the memory of Europe’s cultural heritage, and in particular the Holocaust, for future generations. Existing memorial sites or museums offer a traditional historiographical approach. We propose to use virtual and augmented reality techniques to reconstruct sites of WW-II crimes and their interrelated structures. SPECS’s approach combines virtual and augmented reality with integrated databases of graphical reconstructions and historical sources to allow us to actively explore and try to comprehend the incomprehensible: the massive scale of the crimes Nazi Germany perpetrated on the world and the depth of the destruction and suffering it caused. The SPECS research group has been pioneering this approach over the last 15 years and grounded it in its fundamental research in psychology and neuroscience. In collaboration with the Bergen-Belsen memorial site and Prof. Habbo Knoch, this paradigm has been elaborated to conserve and present the history of the Bergen Belsen concentration camp. Technology evolves and advances faster than ever in all aspects of our society. Thus, it is important that the next generations of students learn as much as possible about emerging technology and stay competitive. SPECS contributes to the education of the next generations by combining platforms for training and outreach activities, facilitating multidisciplinary education and innovation by sharing the value of convergent science, excellence, and societal impact. We have developed Educational Robotics programs for students of the primary and secondary school, as well as courses to train teachers and young adults. There is a growing interest in understanding creativity from a more neuroscientific point of view, so to say, to disclose the neural basis of creativity we will need great insights on how the brain elaborates the process of human thought. Our approach to understanding the process of creativity is to use Art & Technology to create high impact, sophisticated man-machine interaction tools. The Psychophysiology lab studies how humans react to various uni- and multisensory signals – visual, auditory and tactile stimuli. We assess human responses at different levels using subjective ratings, behavioral data, physiological and brain wave recordings. This data helps us to understand human perception and cognition mechanisms, with particular stress on the novel methods for diagnosis and treatment of various brain disorders (chronic pain, migraine, autism, depression, Alzheimer’s disease). More than thirty students from all over the world have arrived at the UPC Campus Diagonal-Besòs for the 11th Barcelona Cognition Brain and Technology summer school (BCBT2018), an annual event co-organised by IBEC’s SPECS group. Last weekend IBEC participated in Barcelona’s twelfth Festival de la Ciència with a host of activities. The seven BIST centres – including IBEC – have a stand at this year’s Youth Mobile Festival (YoMo), part of the Mobile World Congress that’s taking place this week. IBEC has added to its physical locations, with two groups moving to a new site at the other end of av. Diagonal. The SPECS group’s paper that came out in Proc. R. Soc. B just before Christmas, which proposed that fast, reactive motor actions result from the ability of the brain to simulate the future, was featured in El Mundo this week. Last Saturday, another “Classico” saw Messi and Ronaldo display their other-worldly skills and ball control. At the heart of their performance stands the amazing ability to control their bodies in anticipation of the movements of their team members, opponents – and especially the football. IBEC welcomed Prof. Edvard Moser, Nobel Prize in Medicine or Physiology 2014, as the keynote speaker in a special event to mark the move of ICREA professor and ERC grantee Prof. Paul Verschure to the institute. The Institute for Bioengineering of Catalonia (IBEC) gains a world-renowned neuroscientist and psychologist with the move this week of ICREA professor Paul Verschure and his Synthetic Perceptive, Emotive and Cognitive Systems group (SPECS) from the Universitat Pompeu Fabra to the institute. This paper introduces a cognitive architecture for a humanoid robot to engage in a proactive, mixed-initiative exploration and manipulation of its environment, where the initiative can originate from both the human and the robot. The framework, based on a biologically-grounded theory of the brain and mind, integrates a reactive interaction engine, a number of state-of-the art perceptual and motor learning algorithms, as well as planning abilities and an autobiographical memory. The architecture as a whole drives the robot behavior to solve the symbol grounding problem, acquire language capabilities, execute goal-oriented behavior, and express a verbal narrative of its own experience in the world. We validate our approach in human-robot interaction experiments with the iCub humanoid robot, showing that the proposed cognitive architecture can be applied in real time within a realistic scenario and that it can be used with naive users. The kind of help a student receives during a task has been shown to play a significant role in their learning process. We designed an interaction scenario with a robotic tutor, in real-life settings based on an inquiry-based learning task. We aim to explore how learners' performance is affected by the various strategies of a robotic tutor. We explored two kinds of(presumable) help: hints (which were specific to the level or general to the task) or distractions (information not relevant to the task: either a joke or a curious fact). Our results suggest providing hints to the learner and distracting them with curious facts as more effective than distracting them with humour. 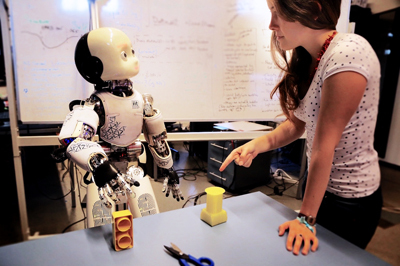 Generating complex, human-like behaviour in a humanoid robot like the iCub requires the integration of a wide range of open source components and a scalable cognitive architecture. Hence, we present the iCub-HRI library which provides convenience wrappers for components related to perception (object recognition, agent tracking, speech recognition, touch detection), object manipulation (basic and complex motor actions) and social interaction (speech synthesis, joint attention) exposed as a C++ library with bindings for Java (allowing to use iCub-HRI within Matlab) and Python. In addition to previously integrated components, the library allows for simple extension to new components and rapid prototyping by adapting to changes in interfaces between components. We also provide a set of modules which make use of the library, such as a high-level knowledge acquisition module and an action recognition module. The proposed architecture has been successfully employed for a complex human-robot interaction scenario involving the acquisition of language capabilities, execution of goal-oriented behaviour and expression of a verbal narrative of the robot's experience in the world. Accompanying this paper is a tutorial which allows a subset of this interaction to be reproduced. The architecture is aimed at researchers familiarising themselves with the iCub ecosystem, as well as expert users, and we expect the library to be widely used in the iCub community. In order to understand the formation of social conventions we need to know the specific role of control and learning in multi-agent systems. To advance in this direction, we propose, within the framework of the Distributed Adaptive Control (DAC) theory, a novel Control-based Reinforcement Learning architecture (CRL) that can account for the acquisition of social conventions in multi-agent populations that are solving a benchmark social decision-making problem. Our new CRL architecture, as a concrete realization of DAC multi-agent theory, implements a low-level sensorimotor control loop handling the agent's reactive behaviors (pre-wired reflexes), along with a layer based on model-free reinforcement learning that maximizes long-term reward. We apply CRL in a multi-agent game-theoretic task in which coordination must be achieved in order to find an optimal solution. We show that our CRL architecture is able to both find optimal solutions in discrete and continuous time and reproduce human experimental data on standard game-theoretic metrics such as efficiency in acquiring rewards, fairness in reward distribution and stability of convention formation. The embodied mammalian brain evolved to adapt to an only partially known and knowable world. The adaptive labeling of the world is critically dependent on the neocortex which in turn is modulated by a range of subcortical systems such as the thalamus, ventral striatum, and the amygdala. A particular case in point is the learning paradigm of classical conditioning where acquired representations of states of the world such as sounds and visual features are associated with predefined discrete behavioral responses such as eye blinks and freezing. Learning progresses in a very specific order, where the animal first identifies the features of the task that are predictive of a motivational state and then forms the association of the current sensory state with a particular action and shapes this action to the specific contingency. This adaptive feature selection has both attentional and memory components, i.e., a behaviorally relevant state must be detected while its representation must be stabilized to allow its interfacing to output systems. Here, we present a computational model of the neocortical systems that underlie this feature detection process and its state-dependent modulation mediated by the amygdala and its downstream target the nucleus basalis of Meynert. In particular, we analyze the role of different populations of inhibitory interneurons in the regulation of cortical activity and their state-dependent gating of sensory signals. In our model, we show that the neuromodulator acetylcholine (ACh), which is in turn under control of the amygdala, plays a distinct role in the dynamics of each population and their associated gating function serving the detection of novel sensory features not captured in the state of the network, facilitating the adjustment of cortical sensory representations and regulating the switching between modes of attention and learning. Bacterial lipopolysaccharide (LPS) induces an acute inflammatory response across multiple organs, primarily via Toll-like receptor 4 (TLR4). We sought to define novel aspects of the complex spatiotemporal dynamics of LPS-induced inflammation using computational modeling, with a special focus on the timing of pathological systemic spillover. An analysis of principal drivers of LPS-induced inflammation in the heart, gut, lung, liver, spleen, and kidney to assess organ-specific dynamics, as well as in the plasma (as an assessment of systemic spillover), was carried out using data on 20 protein-level inflammatory mediators measured over 0-48h in both C57BL/6 and TLR4-null mice. Using a suite of computational techniques, including a time-interval variant of Principal Component Analysis, we confirm key roles for cytokines such as tumor necrosis factor-α and interleukin-17A, define a temporal hierarchy of organ-localized inflammation, and infer the point at which organ-localized inflammation spills over systemically. Thus, by employing a systems biology approach, we obtain a novel perspective on the time- and organ-specific components in the propagation of acute systemic inflammation. The grand quest for a scientific understanding of consciousness has given rise to many new theoretical and empirical paradigms for investigating the phenomenology of consciousness as well as clinical disorders associated to it. A major challenge in this field is to formalize computational measures that can reliably quantify global brain states from data. In particular, information-theoretic complexity measures such as integrated information have been proposed as measures of conscious awareness. This suggests a new framework to quantitatively classify states of consciousness. However, it has proven increasingly difficult to apply these complexity measures to realistic brain networks. In part, this is due to high computational costs incurred when implementing these measures on realistically large network dimensions. Nonetheless, complexity measures for quantifying states of consciousness are important for assisting clinical diagnosis and therapy. This article is meant to serve as a lookup table of measures of consciousness, with particular emphasis on clinical applicability. We consider both, principle-based complexity measures as well as empirical measures tested on patients. We address challenges facing these measures with regard to realistic brain networks, and where necessary, suggest possible resolutions. We address challenges facing these measures with regard to realistic brain networks, and where necessary, suggest possible resolutions. When learning new environments, rats often pause at decision points and look back and forth over their possible trajectories as if they were imagining the future outcome of their actions, a behavior termed “Vicarious trial and error” (VTE). As the animal learns the environmental configuration, rats change from deliberative to habitual behavior, and VTE tends to disappear, suggesting a functional relevance in the early stages of learning. Despite the extensive research on spatial navigation, learning and VTE in the rat model, fewer studies have focused on humans. Here, we tested whether head-scanning behaviors that humans typically exhibit during spatial navigation are as predictive of spatial learning as in the rat. 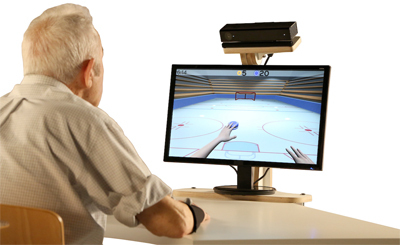 Subjects performed a goal-oriented virtual navigation task in a symmetric environment. Spatial learning was assessed through the analysis of trajectories, timings, and head orientations, under habitual and deliberative spatial navigation conditions. As expected, we found that trajectory length and duration decreased with the trial number, implying that subjects learned the spatial configuration of the environment over trials. Interestingly, IdPhi (a standard metric of VTE) also decreased with the trial number, suggesting that humans benefit from the same head-orientation scanning behavior as rats at spatial decision-points. Moreover, IdPhi captured exclusively at the first decision-point of each trial, was correlated with trial trajectory duration and length. Our findings demonstrate that in VTE is a signature of the stage of spatial learning in humans, and can be used to predict performance in navigation tasks with high accuracy. Air traffic controllers are required to perform complex tasks which require attention and high precision. This study investigates how the difficulty of such tasks influences emotional states, cognitive workload and task performance. We use quantitative and qualitative measurements, including the recording of pupil dilation and changes in affect using questionnaires. Participants were required to perform a number of air traffic control tasks using the immersive human accessible Virtual Reality space in the "eXperience Induction Machine". Based on the data collected, we developed and validated a model which integrates personality, workload and affective theories. Our results indicate that the difficulty of an air traffic control task has a direct influence on cognitive workload as well as on the self-reported mood; whereas both mood and workload seem to change independently. In addition, we show that personality, in particular neuroticism, affects both mood and performance of the participants. There has been intense debate on the question of whether the brain is a computer. If so, that challenge is to show that all cognitive processes can be described by algorithms running on a universal Turing machine. By extension that implies consciousness is a computational process. Both Penrose and Searle have vehemently argued against this view, proposing that consciousness is a fundamentally non-computational process. Even proponents of the brain as a computer metaphor such a Dennett agree that the organizational architecture of the brain is unlike any computing system ever conceived, possibly alluding to non-classical computational processes. The latter class of processes veer away from any program that can be encoded by Church’s lambda calculus. In fact, such a program would have to be based on non-classical logic (either semi-classical or quantum). But quantum logic or machines that might implement them typically are not meant for solving the same type of problems that a classical computer solves (nor are they necessarily faster for any given problem). We will argue that machines implementing non-classical logic might be better suited for simulation rather than computation (a la Turing). It is thus reasonable to pit simulation as an alternative to computation and ask whether the brain, rather than computing, is simulating a model of the world in order to make predictions and guide behavior. If so, this suggests a hardware supporting dynamics more akin to a quantum many-body field theory. Depression is a common sequela after stroke and has severe implications on a patient’s life. Post-stroke depression has been linked to cognitive impairment, but the mechanisms that lead to this deficit are not well understood. We tested 18 chronic stroke patients with depression in a psychophysical task to evaluate their attentional processing under varying cognitive loads. We found that the level of depression had no effect on the unconscious, bottom-up components of attentional processing but did influence the top-down ones. These results support the notion that depression might act like an additional cognitive load, impeding the conscious processes and responses although the information has been unconsciously processed. In this paper, we argue that the future of Artificial Intelligence research resides in two keywords: integration and embodiment. We support this claim by analyzing the recent advances in the field. Regarding integration, we note that the most impactful recent contributions have been made possible through the integration of recent Machine Learning methods (based in particular on Deep Learning and Recurrent Neural Networks) with more traditional ones (e.g. Monte-Carlo tree search, goal babbling exploration or addressable memory systems). Regarding embodiment, we note that the traditional benchmark tasks (e.g. visual classification or board games) are becoming obsolete as state-of-the-art learning algorithms approach or even surpass human performance in most of them, having recently encouraged the development of first-person 3D game platforms embedding realistic physics. Building on this analysis, we first propose an embodied cognitive architecture integrating heterogeneous subfields of Artificial Intelligence into a unified framework. We demonstrate the utility of our approach by showing how major contributions of the field can be expressed within the proposed framework. We then claim that benchmarking environments need to reproduce ecologically-valid conditions for bootstrapping the acquisition of increasingly complex cognitive skills through the concept of a cognitive arms race between embodied agents. Insects are great explorers, able to navigate through long-distance trajectories and successfully find their way back. Their navigational routes cross dynamic environments suggesting adaptation to novel configurations. Arthropods and vertebrates share neural organizational principles and it has been shown that rodents modulate their neural spatial representation accordingly with environmental changes. However, it is unclear whether insects reflexively adapt to environmental changes or retain memory traces of previously explored situations. We sought to disambiguate between insect behavior in environmental novel situations and reconfiguration conditions. 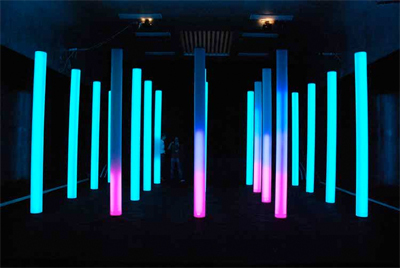 An immersive mixed-reality multi-sensory setup was built to replicate multi-sensory cues. We have designed an experimental setup where female crickets Gryllus Bimaculatus were trained to move towards paired auditory and visual cues during primarily phonotactic driven behavior. We hypothesized that insects were capable of identifying sensory modifications in known environments. Our results show that, regardless of the animal’s history, novel situation conditions did not compromise the animals performance and navigational directionality towards a new target location. However, in trials where visual and auditory stimuli were spatially decoupled, the animals heading variability towards a previously known position significantly increased. Our findings showed that crickets can behaviorally manifest environmental reconfiguration, suggesting the encoding for spatial representation. In this paper, we propose an alternative to model-free reinforcement learning approaches that recently have demonstrated Theory-of-Mind like behaviors. We propose a game theoretic approach to the problem in which pure RL has demonstrated to perform below the standards of human-human interaction. In this context, we propose alternative learning architectures that complement basic RL models with the ability to predict the other’s actions. This architecture is tested in different scenarios where agents equipped with similar or varying capabilities compete in a social game. Our different interaction scenarios suggest that our model-based approaches are especially effective when competing against models of equivalent complexity, in contrast to our previous results with more basic predictive architectures. We conclude that the evolution of mechanisms that allow for the control of other agents provide different kinds of advantages that can become significant when interacting with different kinds of agents. We argue that no single proposed addition to the learning architecture is sufficient to optimize performance in these scenarios, but a combination of the different mechanisms suggested is required to achieve near-optimal performance in any case. Machine Learning algorithms (and in particular Reinforcement Learning (RL)) have proved very successful in recent years. These have managed to achieve super-human performance in many different tasks, from video-games to board-games and complex cognitive tasks such as path-planning or Theory of Mind (ToM) on artificial agents. Nonetheless, this super-human performance is also super-artificial. Despite some metrics are better than what a human can achieve (i.e. cumulative reward), in less common metrics (i.e. time to learning asymptote) the performance is significantly worse. Moreover, the means by which those are achieved fail to extend our understanding of the human or mammal brain. Moreover, most approaches used are based on black-box optimization, making any comparison beyond performance (e.g. at the architectural level) difficult. In this position paper, we review the origins of reinforcement learning and propose its extension with models of learning derived from fear and avoidance behaviors. We argue that avoidance-based mechanisms are required when training on embodied, situated systems to ensure fast and safe convergence and potentially overcome some of the current limitations of the RL paradigm. The components of a Living Machine must be integrated into a functioning whole, which requires a detailed understanding of the architecture of living machines. This chapter starts with a conceptual and historical analysis which from Plato brings us to nineteenth-century neuroscience and early concepts of the layered structure of nervous systems. These concepts were further captured in the cognitive behaviorism of Tolman and came to full fruition in the cognitive revolution of the second half of the twentieth century. Verschure subsequently describes the most relevant proposals of cognitive architectures followed by an overview of the few proposals stemming from modern neuroscience on the architecture of the brain. Subsequently, we will look at contemporary contenders that mediate between cognitive and brain architecture. An important challenge to any model of cognitive architectures is how to benchmark it. Verschure proposes the Unified Theories of Embodied Minds (UTEM) benchmark which advances from Newell’s classic Unified Theories of Cognition benchmark. Traditional symbol processing AI has been criticized on many grounds. Well known criticisms concern, among others, brittleness, lack of learning and generalization capacity, lack of fault and noise tolerance, neural implausibility, and the inability to perform in real time. More recently there has been much discussion about situatedness, grounding, and the frame problem. This chapter presents the Distributed Adaptive Control (DAC) theory of the mind and brain of living machines. DAC provides an explanatory framework for biological brains and an integration framework for synthetic ones. DAC builds on several themes presented in the handbook: it integrates different perspectives on mind and brain, exemplifies the synthetic method in understanding living machines, answers well-defined constraints faced by living machines, and provides a route for the convergent validation of anatomy, physiology, and behavior in our explanation of biological living machines. DAC addresses the fundamental question of how a living machine can obtain, retain, and express valid knowledge of its world. We look at the core components of DAC, specific benchmarks derived from the engagement with the physical and the social world (the H4W and the H5W problems) in foraging and human–robot interaction tasks. Lastly we address how DAC targets the UTEM benchmark and the relation with contemporary developments in AI. This chapter takes the view that emotions of living machines can be seen from the perspective of self-regulation and appraisal. We will first look at the pragmatic needs to endow machines with emotions and subsequently describe some of the historical background of the science of emotions and its different interpretations and links to affective neuroscience. Subsequently, we argue that emotions can be cast in terms of self-regulation where they provide for a descriptor of the state of the homeostatic processes that maintain the relationship between the agent and its internal and external environment. We augment the notion of homeostasis with that of allostasis which signifies a change from stability through a fixed equilibrium to stability through continuous change. The chapter shows how this view can be used to create complex living machines where emotions are anchored in the need fulfillment of the agent, in this case considering both utilitarian and epistemic needs. This chapter discusses basic concepts from control theory and machine learning to facilitate a formal understanding of animal learning and motor control. It first distinguishes between feedback and feed-forward control strategies, and later introduces the classification of machine learning applications into supervised, unsupervised, and reinforcement learning problems. Next, it links these concepts with their counterparts in the domain of the psychology of animal learning, highlighting the analogies between supervised learning and classical conditioning, reinforcement learning and operant conditioning, and between unsupervised and perceptual learning. Additionally, it interprets innate and acquired actions from the standpoint of feedback vs anticipatory and adaptive control. Finally, it argues how this framework of translating knowledge between formal and biological disciplines can serve us to not only structure and advance our understanding of brain function but also enrich engineering solutions at the level of robot learning and control with insights coming from biology. This roadmap identifies current trends in biomimetic and biohybrid systems together with their implications for future research and innovation. Important questions include the scale at which these systems are defined, the types of biological systems addressed, the kind of principles sought, the differences between biologically based and biologically inspired approaches, the role in the understanding of living systems, relevant application domains, common benchmarks, the relation to other fields, and developments on the horizon. We interviewed and collated answers from experts who have been involved a series of events organized by the Convergent Science Network. These answers were then collated into themes of research. Overall, we see a field rapidly expanding in influence and impact. As such, this report will provide information to researchers and scientific policy makers on contemporary biomimetics and its future, together with pointers to further reading on relevant topics within this handbook. This chapter introduces the “Capabilities” section of the Handbook of Living Machines. Where the previous section considered building blocks, we recognize that components or modules do not automatically make systems. Hence, in the remainder of this handbook, the emphasis is toward the capabilities of living systems and their emulation in artifacts. Capabilities often arise from the integration of multiple components and thus sensitize us to the need to develop a system-level perspective on living machines. Here we summarize and consider the 14 contributions in this section which cover perception, action, cognition, communication, and emotion, and the integration of these through cognitive architectures into systems that can emulate the full gamut of integrated behaviors seen in animals including, potentially, our own capacity for consciousness. A major challenge in cognitive science and AI is to understand how intelligent agents might be able to predict mental states of other agents during complex social interactions. What are the computational principles of such a Theory of Mind (ToM)? In previous work, we have investigated hypotheses of how the human brain might realize a ToM of other agents in a multi-agent social scenario. In particular, we have proposed control-based cognitive architectures to predict the model of other agents in a game-theoretic task (Battle of the Exes). Our multi-layer architecture implements top-down predictions from adaptive to reactive layers of control and bottom-up error feedback from reactive to adaptive layers. We tested cooperative and competitive strategies among different multi-agent models, demonstrating that while pure RL leads to reasonable efficiency and fairness in social interactions, there are other architectures that can perform better in specific circumstances. However, we found that even the best predictive models fall short of human data in terms of stability of social convention formation. In order to explain this gap between humans and predictive AI agents, in this work we propose introducing the notion of trust in the form of mutual agreements between agents that might enhance stability in the formation of conventions such as turn-taking. How do the sciences of mind and brain—neuroscience, psychology, cognitive science, and artificial intelligence (AI)—stand in relation to each other in the 21st century? This chapter proposes that despite our knowledge expanding at ever-accelerating rates, our understanding of the relationship between mind and brain is, in some important sense, becoming less and less. An increasing explanatory gap can only be bridged by a multi-tiered and integrated theoretical framework that recognizes the value of developing explanations at different levels, combining these into cross-level integrated theories, and directly contributing to new technologies that improve the human condition. Development of technologies that instantiate principles gleaned from the study of the mind and brain, or biomimetic technologies, is a key part of the validation process for scientific theories of mind and brain. We call this strategy for the integration of science and engineering a Living Machines approach. Following this path can lead not only to better science, and useful engineering, but also a richer view of human experience and of relationships between science, engineering, and art. Biomimetics is the development of novel technologies through the distillation of principles from the study of biological systems. Biohybrid systems are formed by at least one biological component—an already existing living system—and at least one artificial, newly engineered component. The development of either biomimetic or biohybrid systems requires a deep understanding of the operation of living systems, and the two fields are united under the theme of “living machines”—the idea that we can construct artifacts that not only mimic life but share some of the same fundamental principles. This chapter sets out the philosophy and history underlying this Living Machines approach and sets the scene for the remainder of this book. In the absence of a first-principles definition, the concept of intelligence is often specified in terms of its phenomenological functions as a capacity or ability to solve problems autonomously. Whenever an agent, biological or artificial, possesses this ability, it is considered intelligent, otherwise not. While this description serves as a useful correlate of intelligence, it is far from a principled explanation that provides a general, yet precise definition along with predictions of mechanisms leading to intelligent behavior. We do not want an explanation to depend on any functionality that itself might be a consequence of intelligence. A possible conceptualization of a function-free approach might be to formulate the concept in terms of dynamical information complexity. This constitute a first step towards a statistical mechanics theory of intelligence. In this paper, we outline the steps towards a physics-based definition of intelligence. This book constitutes the proceedings of the 7th International Conference on Biomimetic and Biohybrid Systems, Living Machines 2018, held in Paris, France, in July 2018. The 40 full and 18 short papers presented in this volume were carefully reviewed and selected from 60 submissions. The theme of the conference targeted at the intersection of research on novel life-like technologies inspired by the scientific investigation of biological systems, biomimetics, and research that seeks to interface biological and artificial systems to create biohybrid systems. Biomimetics is the development of novel technologies through the distillation of ideas from the study of biological systems. Biohybrids are formed through the combination of at least one biological component—an existing living system—and at least one artificial, newly engineered component. These two fields are united under the theme of Living Machines—the idea that we can construct artifacts that not only mimic life but also build on the same fundamental principles. The research described in this volume seeks to understand and emulate life’s ability to self-organize, metabolize, grow, and reproduce; to match the functions of living tissues and organs such as muscles, skin, eyes, ears, and neural circuits; to replicate cognitive and physical capacities such as perception, attention, locomotion, grasp, emotion, and consciousness; and to assemble all of these elements into integrated systems that can hold a technological mirror to life or that have the capacity to merge with it. We conclude with contributions from philosophers, ethicists, and futurists on the potential impacts of this remarkable research on society and on how we see ourselves. Humans display anticipatory motor responses to minimize the adverse effects of predictable perturbations. A widely accepted explanation for this behavior relies on the notion of an inverse model that, learning from motor errors, anticipates corrective responses. Here, we propose and validate the alternative hypothesis that anticipatory control can be realized through a cascade of purely sensory predictions that drive the motor system, reflecting the causal sequence of the perceptual events preceding the error. We compare both hypotheses in a simulated anticipatory postural adjustment task. We observe that adaptation in the sensory domain, but not in the motor one, supports the robust and generalizable anticipatory control characteristic of biological systems. Our proposal unites the neurobiology of the cerebellum with the theory of active inference and provides a concrete implementation of its core tenets with great relevance both to our understanding of biological control systems and, possibly, to their emulation in complex artefacts. Planar intra-cortical electrode (Utah) arrays provide a unique window into the spatial organization of cortical activity. Reconstruction of the current source density (CSD) underlying such recordings, however, requires “inverting” Poisson’s equation. For inter-laminar recordings, this is commonly done by the CSD method, which consists in taking the second-order spatial derivative of the recorded local field potentials (LFPs). Although the CSD method has been tremendously successful in mapping the current generators underlying inter-laminar LFPs, its application to planar recordings is more challenging. While for inter-laminar recordings the CSD method seems reasonably robust against violations of its assumptions, is it unclear as to what extent this holds for planar recordings. One of the objectives of this study is to characterize the conditions under which the CSD method can be successfully applied to Utah array data. Using forward modeling, we find that for spatially coherent CSDs, the CSD method yields inaccurate reconstructions due to volume-conducted contamination from currents in deeper cortical layers. An alternative approach is to “invert” a constructed forward model. The advantage of this approach is that any a priori knowledge about the geometrical and electrical properties of the tissue can be taken into account. Although several inverse methods have been proposed for LFP data, the applicability of existing electroencephalographic (EEG) and magnetoencephalographic (MEG) inverse methods to LFP data is largely unexplored. Another objective of our study therefore, is to assess the applicability of the most commonly used EEG/MEG inverse methods to Utah array data. Our main conclusion is that these inverse methods provide more accurate CSD reconstructions than the CSD method. We illustrate the inverse methods using event-related potentials recorded from primary visual cortex of a macaque monkey during a motion discrimination task. Many hippocampal cell types are characterized by a progressive increase in scale along the dorsal-to-ventral axis, such as in the cases of head-direction, grid and place cells. Also located in the medial entorhinal cortex (MEC), border cells would be expected to benefit from such scale modulations. However, this phenomenon has not been experimentally observed. Grid cells in the MEC of mammals integrate velocity related signals to map the environment with characteristic hexagonal tessellation patterns. Due to the noisy nature of these input signals, path integration processes tend to accumulate errors as animals explore the environment, leading to a loss of grid-like activity. It has been suggested that border-to-grid cells' associations minimize the accumulated grid cells' error when rodents explore enclosures. Thus, the border-grid interaction for error minimization is a suitable scenario to study the effects of border cell scaling within the context of spatial representation. In this study, we computationally address the question of (i) border cells' scale from the perspective of their role in maintaining the regularity of grid cells' firing fields, as well as (ii) what are the underlying mechanisms of grid-border associations relative to the scales of both grid and border cells. Our results suggest that for optimal contribution to grid cells' error minimization, border cells should express smaller firing fields relative to those of the associated grid cells, which is consistent with the hypothesis of border cells functioning as spatial anchoring signals. In this paper, we argue that the future of Artificial Intelligence research resides in two keywords: integration and embodiment. We support this claim by analyzing the recent advances of the field. Regarding integration, we note that the most impactful recent contributions have been made possible through the integration of recent Machine Learning methods (based in particular on Deep Learning and Recurrent Neural Networks) with more traditional ones (e.g. Monte-Carlo tree search, goal babbling exploration or addressable memory systems). Regarding embodiment, we note that the traditional benchmark tasks (e.g. visual classification or board games) are becoming obsolete as state-of-the-art learning algorithms approach or even surpass human performance in most of them, having recently encouraged the development of first-person 3D game platforms embedding realistic physics. Building upon this analysis, we first propose an embodied cognitive architecture integrating heterogenous sub-fields of Artificial Intelligence into a unified framework. We demonstrate the utility of our approach by showing how major contributions of the field can be expressed within the proposed framework. We then claim that benchmarking environments need to reproduce ecologically-valid conditions for bootstrapping the acquisition of increasingly complex cognitive skills through the concept of a cognitive arms race between embodied agents. The embodied mammalian brain evolved to adapt to an only partially known and knowable world. The adaptive labeling of the world is critically dependent on the neocortex which in turn is modulated by a range of subcortical systems such as the thalamus, ventral striatum and the amygdala. A particular case in point is the learning paradigm of classical conditioning where acquired representations of states of the world such as sounds and visual features are associated with predefined discrete behavioral responses such as eye blinks and freezing. Learning progresses in a very specific order, where the animal first identifies the features of the task that are predictive of a motivational state and then forms the association of the current sensory state with a particular action and shapes this action to the specific contingency. This adaptive feature selection has both attentional and memory components, i.e. a behaviorally relevant state must be detected while its representation must be stabilized to allow its interfacing to output systems. Here we present a computational model of the neocortical systems that underlie this feature detection process and its state dependent modulation mediated by the amygdala and its downstream target, the nucleus basalis of Meynert. Specifically, we analyze how amygdala driven cholinergic modulation these mechanisms through computational modeling and present a framework for rapid learning of behaviorally relevant perceptual representations. 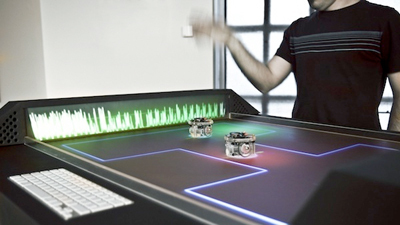 EXperience Induction Machine (XIM), an immersive room equipped with a number of sensors and effectors that have been constructed to conduct experiments in mixed-reality. In 2014, SPECS created the spin-off company “Eodyne“.